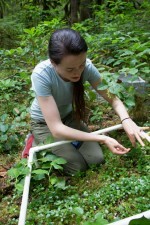 Undergraduate students are a valued part of the research program at the HJ Andrews Experimental Forest (AND) Long Term Ecological Research (LTER) site. During the summer 2014 field season, AND hosted a number of undergraduate field and lab technicians, undergraduate class and field trip participants, and Research Experience for Undergraduate (REU) students sponsored by the National Science Foundation. Students participated in research on stream productivity, plant phenology, pollinator networks, computer science, and mathematics. REU participant Janel Hull studied plant phenology with AND PI mentor Mark Schulze. Andrews Forest Eco-Informatics Summer Institute 2014 participants at the Andrews Forest, 2014.